on the woodside. 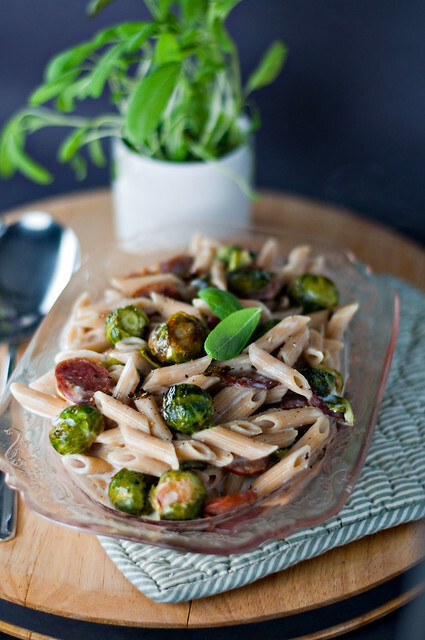 : *sausage–brussels sprouts penne with creamy goat cheese sauce. 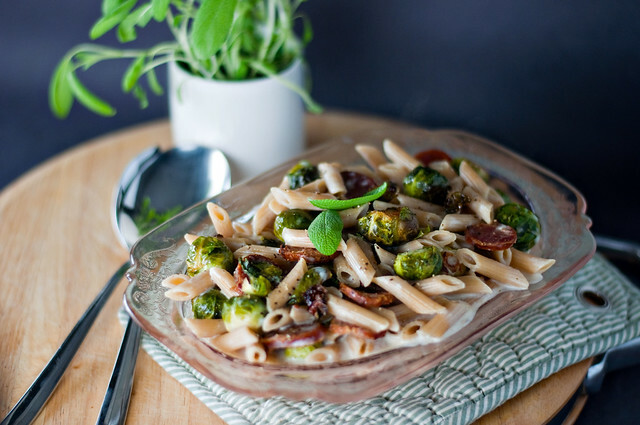 *sausage–brussels sprouts penne with creamy goat cheese sauce. Happy Thanksgiving and Hanukkah week, everybody! Here on the Woodside, we're celebrating with a one-day work week, the traditional parade-family-meal triumvirate on Thanksgiving Day, and putting up the Christmas tree on Friday—which also happens to be my birthday, but it's a boring one this year, so I'm going to celebrate by bringing out the twinkly lights because they're my favorite. In typical fashion around these parts, I volunteered to be responsible for some bits and pieces where the Thanksgiving meal is concerned—because being in the kitchen is also my favorite—and I have done zero planning. I went to the grocery store yesterday and got a pretty good preview of the punishment I'll have to endure for my procrastination. Partly I wait until the last minute to plan because I am a notorious second-guesser, so I'm much better off making impulse decisions where dishes are concerned. But almost without fail, what ends up happening is that I return to a recipe I've made many times before. Especially when feeding a crowd, I have to agree with Ina Garten's mantra that it's much less stressful to stick to something you already know works. That way you have calm confidence, and the people you're feeding have great food. This dish is one of those standbys for me, something I've made and modified so many times I don't even remember where I originally discovered it. It demonstrates my favorite formula for comfort food: savory heat, hearty greens, salty cheese, and—naturally—pasta. It's a simple and easy weeknight meal, which is another reason it's become a standby, but I'm putting it here because it would also make a great way to reuse those Thanksgiving leftovers: Just stir in chopped leftover turkey in place of the sausage, and whatever Brussels sprouts you have remaining from your holiday table. After that it's just a matter of boiling the pasta and stirring through that creamy goat cheese. After lots of trial and error with this dish, I've discovered that the easiest way to approach the Brussels sprouts and sausage is to roast them in the oven together. (It also helps the sprouts take on some of that lovely, spicy sausage flavor.) Because the little cabbage heads can sometimes be unpredictable in terms of how long they need to roast, slice your sausage a little bit thicker than you see here—you want it to come out juicy and substantial with just a little crispiness around the edges; you don't want jerky. When it comes to goat cheese, I think the more coarsely ground black pepper, the better. In that same vein, taste often as you're seasoning—some goat cheese and sausage varieties contain more salt than others, so you don't want to overdo it. I added a few sage leaves to the milk early on in the process, but then strained it out—that gave things a subtle woodsy flavor and aroma without the punch in the taste buds I sometimes think sage can be. Aggressive little herb. I hope you try this dish and return to it as often as I have over the years. And I hope you have as many things to be thankful for as I do. And if you're celebrating Thanksgiving at your house tomorrow, I hope you're a lot more prepared than I am. 1. Preheat oven to 425 degrees. Line a baking sheet with aluminum foil. 2. Place Brussels sprouts on prepared baking sheet; drizzle lightly with olive oil, and sprinkle evenly with salt, black pepper, and red pepper, if desired. Add sausage; roast 20 to 25 minutes or until sprouts are tender and sausage is golden brown. 3. Meanwhile, stir together milk, onion, garlic, and sage leaves in a medium saucepan over medium-low heat until just barely simmering. (Do not boil.) Cook, moderating temperature if necessary, 15 minutes. Drain mixture through a fine, wire-mesh sieve, discarding solids. 4. Melt butter in a skillet over medium heat; whisk in flour and cook 1 minute. Slowly whisk in hot milk, and cook until mixture thickens slightly. Reduce heat to low, and whisk in goat cheese until smooth. Season to taste with salt and black pepper, and keep warm. 5. Cook pasta in boiling salted water according to package directions. Stir together hot pasta, roasted Brussels sprouts and sausage, and goat cheese sauce. Top with additional black pepper, if desired. Makes 4 servings. Wow this looks great. I would omit the sausage as I am vegetarian but I love the brussel sprout/goat cheese combo!